Distance so far: 4207km, -21 C, freezing fog. 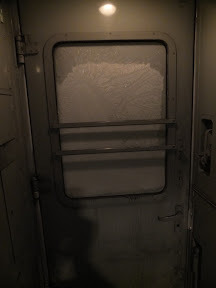 I woke at dawn today (that’s about 09.30 Moscow time) – just in time to try getting off the train for the first time at the stop in Kirov. The drill is that the carriage attendant gets kitted up, enters the outer compartment of the carriage (unheated) and opens the door. He then gets down, scrapes off the ice, sweeps away the snow, and wipes the handles so you can get off safely. All you need to do is agree how long the stop is for – but I’m not trusting my linguistic skills yet (or sign language), so I’m staying close by the train. 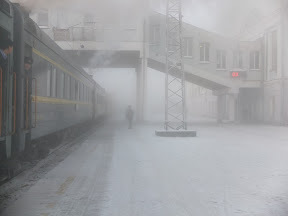 Not much to see on a Kirov station platform at 10am – in fact so much freezing fog that I could not even see my carriage from 50 metres away. The clock on the platform read -21 C, so some useful acclimatisation training as things get colder. We took on coal – yes coal! 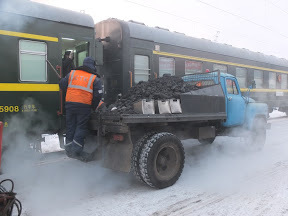 – to feed the boiler that runs the heating and hot water on board each carriage. On closer inspection, we have a small fire alight at one end of our car – the guard also makes his own breakfast on this using a mini wok. We are a Chinese carriage after all! 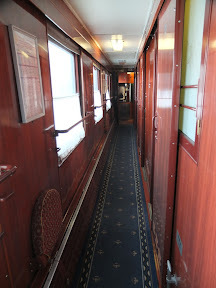 Once we were back on the move I decided to go and explore the train in search of the restaurant carriage. 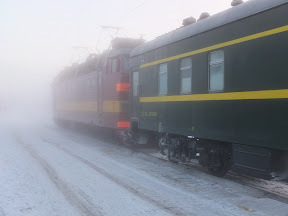 It’s about five cars behind mine in the Russian “sector” of the train. 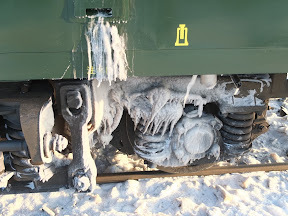 My top tip of the morning is to take gloves on such journeys – between each car in “no man’s land” the handles are frozen and also very sooty. I wonder if you might guess as to how many travellers there are on this 15 carriage international express train? So far I have counted four of us.. I am in fact the only passenger in my first class carriage, and Stephan, a German (from Hamburg) has carriage no. 10 all to himself as well. We think there is an Italian woman in second class somewhere, and possibly a British train spotter further forward, who I saw taking on provisions this morning at Kirov. I know we are out of season, but I never expected it to be this quiet.. Unless the locals are all going to pile in further along the line? What do they know that we don’t about a train through Siberia in late December I wonder? I consulted the map this morning. I was quite surprised to see how much progress we have made overnight – 1194km, despite what I though was a much slower speed on this train. 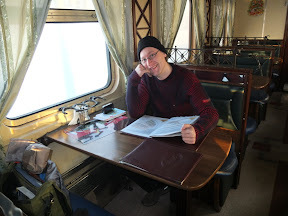 The ride is generally very comfortable, but once in a while a combination of breaking and accelerating causes a sort of train whiplash effect that could almost throw you out of bed – or cause you to spill your gin & tonic.. I’m calling this a “Crazy Ivan”. Good news on the breakfast front – they have a menu with English translations and a chef (if I can call him that) who makes ham and eggs with reasonable filter coffee for 330 roubles (about £7). I might try some dinner there later on.. The blockage of my shower drain is now occupying many of the Chinese crew – there are buckets of hot water, assorted spanners and mops next door – I hope they manage to fix it. Beginning to think you'd gone walkabout!! Here on Lake Geneva, we have snow on the ground, but the weather forecast suggests 19+°C today!! (already very sunny), then tumbling again tomorrow with the mini-possibility of a white Christmas. Be well.